Agriculture Minister Jim Paice updated Parliament today on the progress of payments to farmers under the Single Payment Scheme. As explained in my statement of 8 November, one of the performance indicators I set the Rural Payments Agency (RPA) for the 2011 Single Payment Scheme (SPS) was to pay 78% of the total estimated fund value to a minimum of 86% of eligible claimants by the end of December 2011. I can now confirm to the House that those figures were reached and exceeded. 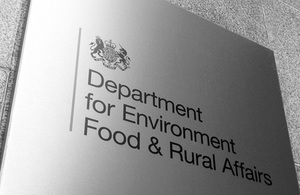 By the end of 31 December 2011, RPA had made payments totalling some £1.427 billion (82.5%) to 92,066 English farmers (87.8%). These figures represent the highest ever proportion of SPS payments made by the Agency in the opening month of the payment window. As such, it is a good example of the progress being made at RPA as it strives to deliver an improved level of service for English farmers in its administration of the scheme. The focus now is on validating the remaining claims and making the related payments as soon as possible. I expect further progress in that regard over January, with a view to ensuring that the second SPS 2011 performance indicator (to have paid a minimum of 95% of both the eligible claimants and the total estimated value by the end of March 2012) is also met.